Perfect for fans of I Dissent comes an inspirational and empowering account of the life of women's rights icon Gloria Steinem. But Gloria grew up during a time when women were not encouraged, or even allowed, to do a lot of the things men could do: go to college, get a job, open a bank account, and more. There were restrictions that made it impossible for women to be independent or equal to men. So, Gloria set out to change that . 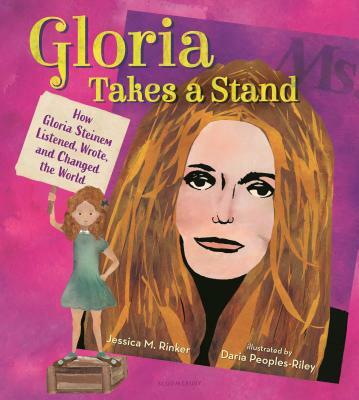 . .
From unconventional childhood, to Smith College, to Ms. magazine, to the women's liberation movement, to feminist icon--Gloria Takes a Stand brings to the page a spirited look at Gloria Steinem's influential life, energizing a new generation of feminists to stand up and demand equal rights for all people.